Readings and Healings by Christy are scheduled directly with her. In a Trance Medium Reading/Healing on your Wellness or Weight issues, Christy will channel a healing being to read the energies which sabotage your wellness goals, as well as remove the negative beings and energies that may create unwellness or weight issues in your body. These are the energies which destroy or hinder your best efforts to make healthy changes in your life! Have you ever had the experience of making a great plan to heal your body, perhaps deciding on a new behavior, food to eat, supplement to take, etc. and then having it go array? Getting so enthused about a new healthier path, only to be hit by the invalidation of failure and self judgement? This is a very common experience among sensitive spirits. Too often when we feel like we have failed, or are just confused about how to create the vitality and wellness we deserve , we struggle in isolation. Receiving a spiritual hello and healing work can go a long way to breaking the hold of the Trance Medium energies which love to control and invalidate. Combining Christy’s expertise as the creator of the WellnessAlchemy Body Healing Protocols and her love of Trance Medium Healing work, she is excited to bring these spaces together to offer these healing/readings for the first time. Christy spent her early years on the Eastern Shore of Maryland and Virginia. From around the age of 16, she developed a burning desire to find other people who where like her - people who experienced reality above and beyond what was acknowledged by others. An ability to read the energies of others, to tell when those around her lied as well as talking to entities who ‘weren’t there’; these were common experiences for her that had no name, except perhaps ‘over active imagination’. After just 2 years at Ohio University, she was chosen to be a part of a University botany expedition to Mexico and Central America. This trip also brought her to Northern California, and here she found an exciting place where she finally felt at home, so in 1973 she moved to the San Francisco Bay Area. By 1975 she had discovered the Berkeley Psychic Institute, and there she had her first aura reading. It was a true spiritual revelation. Sharing the spiritual truths discovered in that first reading though teaching, healing and reading others quickly become her life’s passion. For over 30 years, Christy taught Meditation, Healing and Aura Reading to thousands of students at the Berkeley Psychic Institute. For 15 of those years she was the Director of Clairvoyant Training and Aura Reading, overseeing the training of students in the Clairvoyant Training Program throughout 5 locations in Northern California. In 2000, Christy was conferred with the title of Bishop of the Church of Divine Man, the governing spiritual body of the Berkeley Psychic Institute. In 2001, she moved with her husband to the Big Island of Hawaii, where they currently live on their award winning organic Kona Coffee Farm. Here her interest in healing, and particularly in challanging the programming that says we all have to experience aging as a deteriorating process led her on a new healing journey from which was born the healing modality WellnessAlchemy. This revolutionary healing technique can directly effect healing changes in tissues and systems of the body and has been an exciting new horizon in her Spiritual Healing Practice. 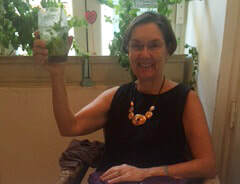 Beginning in January of 2011, in partnership with Spirit is Calling, Christy has been teaching the WellnessAlchemy techniques in a series of classes entitled YOUR MAGICAL BODY as well as the WellnessAlchemy Medical Intuitive Masters Healing Program, the next session of which begins in October 2012. I've had scoliosis (curvature of the spine) since I was about 5 years old. In addition I had a counterclockwise rotation of the trunk of my body developed over the last six years or so. This rotation compressed my right rib cage, further strained my muscles, increased the curvature of my spine and increased the level of pain I experienced each day. In two sessions with Christy (two weeks total), my spine straightened appreciably, my muscles untwisted to the point that both rib cages were the same size and compression, my pain lessened significantly, and most importantly, I have a peace of mind I hadn't known in years. The peace of mind in the form of my body being relaxed, no longer under the physiological stress of strained muscles, facia and skeleton. I am continuing to work with her to straighten out my spine to its potential with marked improvement each treatment. After 6 weeks, the body continues to hold the new position easily. I have been able to increase my exercise, be more active generally, and enjoy a more pleasant emotional relationship with my body. Christy's decades of spiritual training combined with her techniques as a WellnessAlchemist makes her unique in the world today. As a healer myself, I recognize the value she offers to the public. Recently I worked with Christy and her WellnessAlchemy to heal a badly broken wrist. Her findings regarding my needs for healing were clear and helpful and her clairvoyant read on the underlying dynamics of the event were incredibly accurate. I chose to have surgery and Christy supported me in my decision and my healing before, during and after the surgery. After my last doctor visit he said, “ I don’t know what you’re doing but you’re healing wonderfully and ahead of schedule.” I greatly appreciate all the support and healing work I received from Christy, and I would highly recommend her services to anyone in need of spiritual communication about a healing issue. (After my WellnessAlchemy healing) I am noticing that my body feels as though it has less toxins in it...it feels more like "my body" rather than a container full of foreign energy...LOVE the increased energy levels...my body feels like its getting majorly cleaned out and detoxed. I’m writing to say that your generous input was very helpful to me on a number of levels...Life is much brighter now. Every moment I get to spend out of the sickbed and active in the world is another big bite out of LIFE that I get to take, so many, many thanks to you! I have been feeling wonderful. I have energy. I walked a mile this week with no pain. I couldn't believe it. I am a new person or the old me is back. It has been over 15 years or more since i felt this good. Truthfully, since my 50h birthday I have not felt this good. You are a miracle worker. I had tried a thousand pills, acupuncture, herbs, a host of healings, and I would feel well only for a very short time--a few hours, a day or two at the most. This if a miraculous change. I have been walking and enjoying it. I have been sharing this with a few close friends.